This book provides an accessible overview of US defense politics for upper-level students. This new edition has been fully updated and revised, with a new chapter on veterans and new material on topics such as cyberwarfare and lobbying. Analyzing the ways in which the United States prepares for war, the authors demonstrate how political and organizational interests determine US defense policy and warn against over-emphasis on planning, centralization, and technocracy. Emphasizing the process of defense policy-making rather than just the outcomes of that process, US Defense Politics departs from the traditional style of many other textbooks. the effects of 9/11 and the Global War on Terror on security policy, homeland security, government reorganizations, and intra- and inter-service relations. 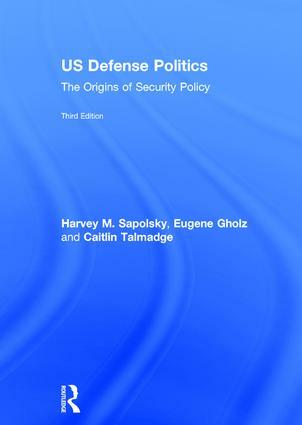 The third edition will be essential reading for students of US defense politics, national security policy, and homeland security, and highly recommended for students of US foreign policy, public policy, and public administration. 5. Who Fights America’s Wars? Harvey M. Sapolsky is Professor of Public Policy and Organization, Emeritus, at Massachusetts Institute of Technology (MIT), Cambridge, Massachusetts, USA, and the former Director of the MIT Security Studies Program. Eugene Gholz is Associate Professor at the Lyndon B. Johnson School of Public Affairs at the University of Texas at Austin, USA. Caitlin Talmadge is Assistant Professor of Political Science and International Affairs at the George Washington University in Washington, DC, USA.